BRYAN EATON/Staff photo. 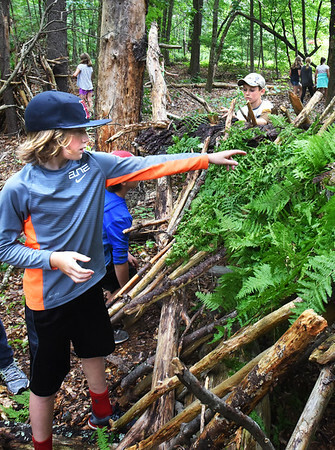 Jack Welch, 11, left, and Michael Sanchez, 12, put bark and ferns on the shelters they and others are making at the Camp Kent Nature Center during the last week of the program run by Amesbury Youth Recreation. The camp's activities are designed to help the youngsters explore the environment and face challenges in the natural world.